Black has replied to 37.a5-a6 with bxa6. With what piece should White recapture? Of course, with the bishop, so e4 stays defended. 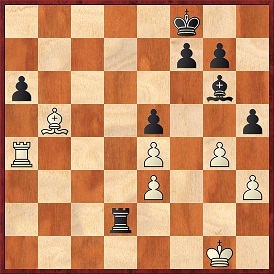 However, epic fail-level blunders occur once or twice a year, and this may be the worst in an equal endgame I have ever committed - I played 38.Rxa6, immediately realised my mistake (my opponent froze for 10 seconds also, unable to believe his eyes), and resigned after 38...hxg4 39.hxg4 Bxe4 40.Kf1 Bf3 41.g5 Rg2 42.g6 Rxg6. Round 2: In the 7-day schedule, there were only 15 players (merged with the 80-player 5-day schedule from Round 5) in a strong field, where I was one of the lowest rated - there were no easy games. My double fianchetto hedgehog as White against a FM eventually worked up a kingside attack, and I got to 50%. Round 3: The posting of pairings was always very late, maybe 15-20 minutes before the game, not giving much time for prep. After success in the opening (surprising my opponent with 1.Nf3 Nf6 2.c4 e6 3.g3 a6, which seems to score respectably), I made the mistake of castling queenside, instead of safely on the kingside, and my whole position came under fire quickly. Round 4: Against a veteran GM. Black seemed comfortable after the opening, but I somehow gained the advantage through normal moves, getting to 50% again. Round 5: A comfortable win against a 2100. Round 6: Although I was happy with the opening against Puchen Wang, after 13.e4 and 14.exf5 which we agreed looked suspicious, Black had the initiative and scored a quick win (27...dxe1=Q 0-1). Round 7: A comfortable win against a 2100 (the yo-yo effect of big opens...). From the start of the tournament, watching the top seeds (and joint winners on 7/9 at the end) Kamsky and Adams play was a valuable experience. Seeing in person these giants who I have grown up reading about in magazines, books and websites, and especially seeing many games of, their focus, calm and sheer presence at the board made a big impression on me.